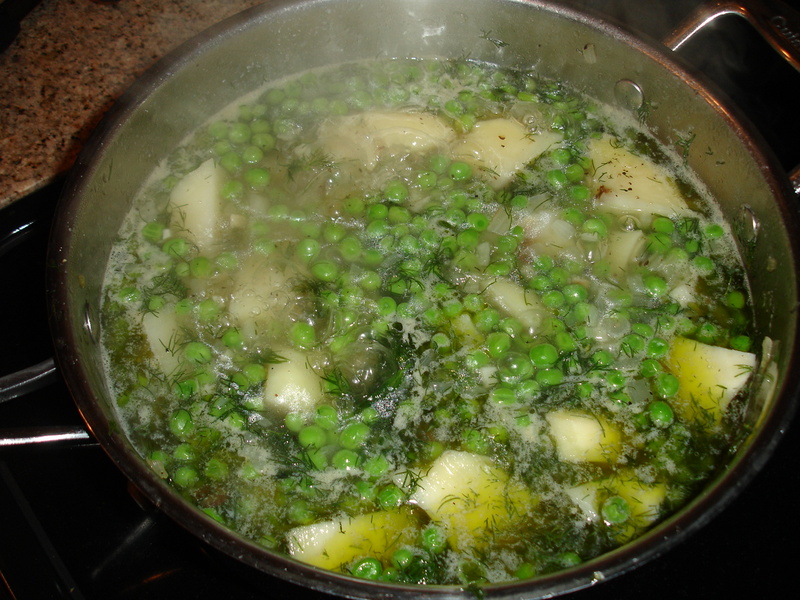 A traditional favorite year round, Greek potatoes and peas is a satisfying, flavorful dish equally delicious served hot on a winter evening and at room temperature on a summer afternoon. I like to use red potatoes because they cook quickly and evenly. I also peel the potatoes in this recipe. The peels, though nutritious, take away from the overall meal for my taste but the choice is yours! Either way, you will love this simple and simply delicious dish! Something to remember – make sure to let the dish rest for 10-15 minutes after taking off the heat or the potatoes will break up into pieces. 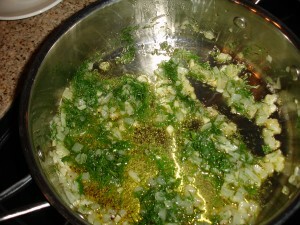 In a 3qt or larger saucepan/pot, heat olive oil and gently cook onions, garlic, dill, salt and pepper. Start your onions about 2-3 minutes before adding the garlic and dill so the garlic doesn’t burn waiting for the onions to become translucent. Add potatoes and peas to the pot. Cook on low/medium heat for about 3 minutes, stirring frequently. Add water and bring up to a boil. Cook 15 minutes for diced potatoes and up to 25 minutes for quartered, until you can pierce them easily with a fork. In a small bowl, mix the lemon juice with flour. 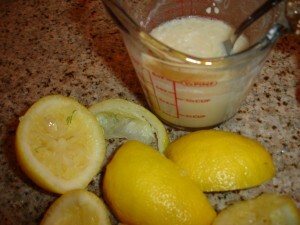 Add lemon/flour to the pot and stir well so that the mixture is completely incorporated. Cook on med/low heat for another 5 minutes. Add wine or additional water, cook for 5 more minutes and you’re done. It’s important to let the dish rest for 10-15 minutes before serving. You can garnish with fresh dill and ground black or white pepper. Serve with a wedge of lemon and a piece of crusty bread. This dish is a great choice for lunch too as the flavors just get better the next day. Also, remember to try it at room temperature on a warm weather day. 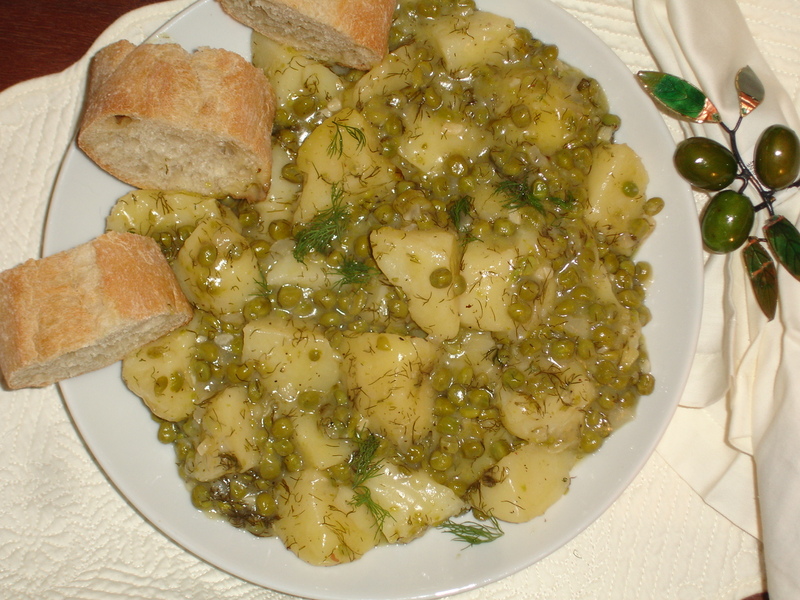 I cooked this last night and it was the best potato dish we’ve had in a long time! The garlic was the perfect amount! We are garlic lovers, and this is was the most subtle amount with the best flavor! My 1 year old couldn’t get enough of it! Thank you for this recipe! Do you know how many cups or servings this recipe makes? It looks delicious and I’d love to cook it for my family! 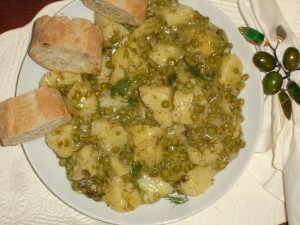 Just prepared this, it’s delicious! This was delicious! I will definitely be making this again 🙂 Thank you for posting!